Hey there! Thanks for dropping by moonhex! Take a look around and grab the RSS feed to stay updated. See you around! The ancient Egyptians have influenced us greatly in many different ways. Their influence on modern day existence stretches over a variety of topics, from religious beliefs to beauty. This paper focuses on the topic of beauty and more specifically that of hair, wigs, makeup, and scented oils. It is no secret that the Egyptians were a people who valued beauty in all its forms. They took it very seriously, dedicating time and energy to it. Now we can uncover their most beautiful secrets. 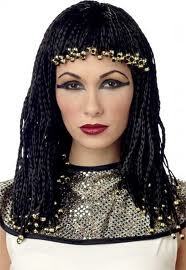 In ancient Egypt, wigs were like gold watches today, not something to be hidden, but shown off. The most expensive and valuable wigs were made of pure human hair. Less expensive wigs were made with wool and/or plant fibers and sold to middle class people. Wig making was a basic and tedious process. First, a skull cap had to be woven from palm fiber. The skull cap was made to fit the head of the wig wearer. Then the hairs made of wool or plant fibers were attached to the cap with beeswax and sometimes they were woven right into the cap. The latter technique produced a stronger wig. Each individual strand of hair had to be attached to the skull cap by hand. Incredibly thick hair was considered beautiful, so it took a long time to finish the fashionable wigs. Before the hair was attached it could be styled (curled, pleated, etc) to create wigs with different hair textures. Rich women reserved the most expensive wigs for special occasions and wore different wigs on a day to day basis. Middle class women often only wore wigs on special occasions. Because of their price and value, the Egyptian wig owners took great care of their beauty investments. The wigs were washed every day that they were used and treated with oil and animal fats. 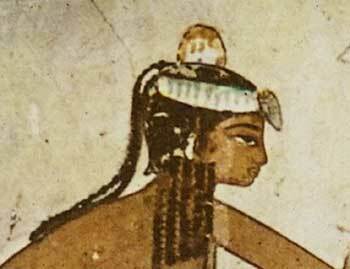 During the Old Kingdom throughout the Middle Kingdom, wigs trended toward shorter hair styles. The wigs during this period were made mostly of three layers of tightly braided hair. They were often cut like a modern day bob around the chin (either a little below or a little above). 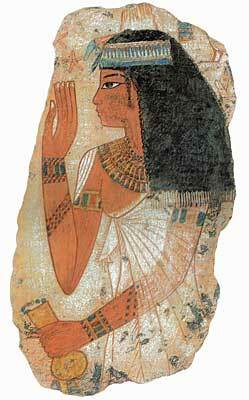 Shorter wigs were actually more popular among the Egyptians. However, there were two long wigs that appeared during this period and were very popular. The first was what we know as the enveloping wig. It was made of one piece full of many braids that circled around the head, covered the ears, and hung partially down the back of the wearer. The second long wig was the tripartite or goddess wig. It was made of three parts in all. One part would hang on each side of the face down to the chest, and the third would hang partially down the back. Throughout the Old and Middle Kingdoms it was only legal for noble women or priestesses to wear the goddess wig. From the end of the Middle Kingdoms to the New Kingdom wig trends had changed so that the women let their natural hair grow longer. They wore longer wigs to match and allowed their natural hair to show beneath their head wear. It was not uncommon for their natural hair to be braided. 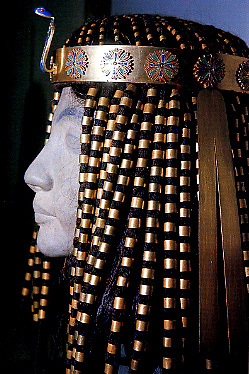 The styles of New Kingdom wigs were relatively basic, although more complex than the short and simple wigs of the Armana period. The most fashionable wigs of the New Kingdom had many tails with tasseled endings. Egyptians were inventive enough to make other fake hair pieces as well. Hair extensions were very popular and practical for every day use. They were less expensive and easier to put into hair styles. As for the color of the wigs, although black was a popular color it was not the only color. Egyptians could dye their hair or wigs red or blonde with henna. Since natural human hair often came from prisoners of war, there were a variety of other colors too. It is clear to Egyptologists that the ancients didn’t just limit themselves to those choices; they must have found other techniques for dyeing their hair. There is slight evidence that one queen actually wore a blue/black wig. All in all, the wigs were definitely not lacking variety! Raising young children in ancient Egypt was no easy feat. Making sure they were clean and healthy was one thing, but worrying about lice was another. To insure completely lice-free children, parents simply shaved the heads of their little boys, except for a lock on the left side of the head. Sources disagree on whether or not the same hairstyle was practiced on the girls. Several sources suggest that very young girls did have shaved heads, unless they were training to be dancers or some other form of entertainer. When they hit puberty, usually around twelve years old, the girls would shave their side-lock and begin growing their hair. Until they were still a little bit older they would wear their hair in decorated pigtails or ponytails. The girls always decorated their hair with amulets, jewelry, flowers, and berries even if they wore only a single lock. Both boys and girls had fish shaped amulets in their hair, for protection from the dangers of the Nile. On a daily basis Egyptian women would put their natural hair up in very sim ple hairstyles, like a ponytail, or they’d just use a headband to hold it back. They would always decorate their hair with gold strands, jewelry, or beads. If they were from a lower class they would have used the same decorations as little girls. Wigs were often decorated in the same manner. Magical amulets were usually worn in the hair for luck and protection. The Egyptians possibly disliked balding even more than we do. Hair extensions were used to hide it, if various different treatments didn’t fix the problem. There were dozens of treatments most including salves, ointments, and essential oils. If a person was having a problem with balding, they would treat it in private and hide it in public. Henna was an incredibly useful cosmetic resource for the Egyptians. Instead of just using it for hair, it was also used to make nail polish, one of the most important cosmetic products in ancient Egypt. Nail polish had a special place in ancient Egypt. Instead of being just another luxury cosmetic, it was used as a clear declaration of the class and social status of the wearer. The color red was reserved only for powerful people as the rule was the more powerful the person, the deeper the shade of red. It was illegal for people of a lower social class or status to wear a shade of red worn by people of influence. The queen had her own nail color entirely, and only she was allowed to wear it. As you can imagine, the nobles took their nail polish very seriously. As a matter of fact, the mummy of a pharaoh was found with its fingers stained red. They had been stained that way after he’d died, but before he was embalmed. In the afterlife, the deep shade of his nails would help put him in the favor of the gods and goddesses. The way henna was used to make nail polish was simple; first it was ground and then mixed with water to create a paste that was used as polish. Henna produced red, orange, or yellow colors this way. 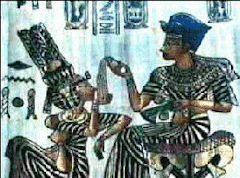 Egyptians of the lower classes had alternative ways of staining their nails in other colors as well. Ever resourceful, they would often use berry juice or any other natural substance that produced a desirable color as less expensive nail polish. Because of its importance to showing class and status, usually both men and women wore nail polish. For their lips and cheeks Egyptians liked to use red ochre. Red ochre is a pigment that comes from naturally tinted clay with mineral oxides. Unlike the incredibly deep shades we find in modern lipstick colors, red ochre adds only a tint of color. This was what made it so perfect when used as blush. It was readily found in the dessert, so it was easily obtained by the Egyptians. It was also a popular lip color. 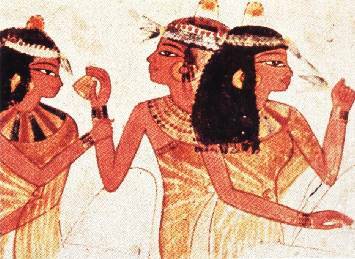 However, if a person desired a different color, they could have used one of the many different Egyptian ‘lipstick’ recipes instead. People would often use natural resources in place of cosmetics. The Egyptians used berry juice, wine dregs, or a number of other natural color stains on their lips. This meant that there were many different color possibilities. Most of the colors were red or variations of red (red/orange, rust red) but purple or dark blackish colors were also popular. There was even a recipe that produced an almost blue blackish lip color. Unfortunately, the Egyptians’ resourcefulness in the lipstick department did not always result in success, due to the fact that not everything natural is edible or healthy. This is apparent concerning the use of a lipstick later known as the “kiss of death”. The kiss of death was an Egyptian recipe made of “a reddish purple mercuric plant dye called fucus – algin, 0.01% iodine, and some bromine mannite”. Unbeknownst to the Egyptian women, it was literally a killer recipe, as it was very poisonous. The illnesses and deaths it caused were the reasons for its legendary name. Kohl in ancient Egypt was possibly the most important thing the Egyptians wore. It was so important that everybody wore kohl around their eyes, from the very day they were first born. This was because it helped protect the eyes from the sun which is something that has been proven to be true. Egyptians also believed it protected the eyes from infection, and other sight problems. Most of all, it was protection against the evil eye. 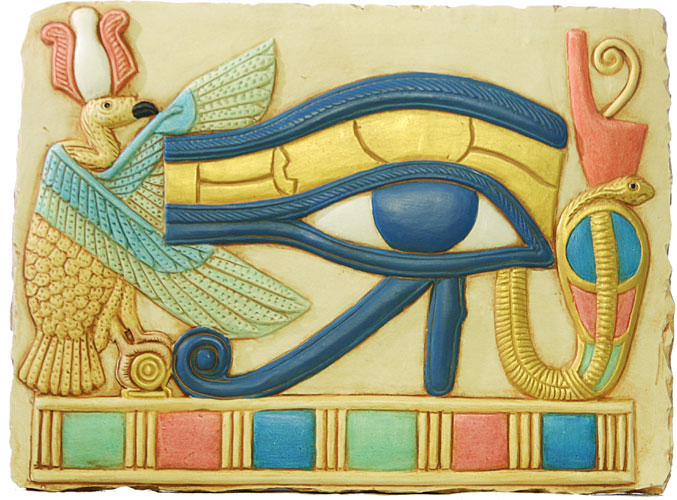 The evil eye was a powerful myth in ancient Egypt. It was believed that anybody who gave another person an envious glance, even for a second, was inadvertently casting a curse on them. This curse could result bad luck, sickness, injury, or death entering the person’s life. However, wearing the eye makeup prevented the effects of the curse from coming to fruition. Green kohl, called udju, and black kohl, called mesdemet, were popular in different time periods. Udju was invented before mesdemet, and it was popular throughout the Old and Middle Kingdoms. It was made from malachite. Malachite is a copper carbonate mineral found in the Sinai Desert. The Egyptians imported malachite from the desert, but they also imported it from other countries as well. The malachite was ground up and mixed with other ingredients included wax, gum, resin, or animal fat. Any of the four other ingredients listed would have been used to help the kohl adhere to the eyelid. Udju was green, the ancient Egyptian color of rebirth and renewal. Mesdemet became popular in the beginning of the New Kingdom. When it did, it also quickly surpassed udju in popularity. It was made mainly from galena, a sulfide mineral, and soot. It had other ingredients, including an adhesive, just like udju. Black meant something quite different then green as it was the color of death. Unlike people today, the Egyptians did not have a negative connotation with death. For them, death only meant a journey to the afterlife. Udju and mesdemet were used for more than just outlining the eyes. The Egyptians also used it to darken the eyelashes and eyebrows. Sometimes they put it on their eyelids too. Saffron or burnt almond were also viable eye shadows, but on a typical day to day basis the only makeup Egyptians used was kohl. Anything extra was for special occasions. For most people, this rule also applied to rouge and lipstick. Kohl was the only makeup worn by everybody every day. Egyptians did not have fancy makeup applicators, like people nowadays. Poor people would have to use any old twig or small stick to apply their makeup. Rich people usually had a fancier applicator that was really just a stick with nice decorations carved into it. Men and women held their makeup in decorated and bejeweled cases. They also had special mirrors for the specific purpose of applying it. Scent was incredibly important to the Egyptians for various reasons. One of them was the pride Egyptians derived from being regarded as the people who mixed the greatest scented oils. To keep their reputation up, the Egyptians made sure they used interesting scents, most of which they imported from other countries. From the Land of Punt they imported aromatic wood scents. Myrrh was also plentiful in Punt, so they bought a lot of that too. They also imported spicy scents (cinnamon, sandalwood, and ginger were popular), flowery scents (jasmine and rose were expensive flowery scents. Lily was a scent indigenous to Egypt) and aromatic wood scents (woods like cedar and oak). Egyptians would usually use an unscented oil like balanos, castor, jojoba, or ben oil as a base for their scented oil mixtures. The actual process to extract the scented oils from their sources was only practiced in the countryside. There were a few different techniques for extracting scents. One popular technique was to steep the flowers, plants, or “splinters of fragrant wood in oil to obtain the essential oil”. The extracted scent (essential oil) would then be mixed with different oils or fats, and all of it would be put in a cloth. The cloth was squeezed and wrung out to remove all of the fragrance. A second technique was to boil the source with water. To obtain the essential oil, all one had to do was skim the oil off the top. Another method is called a mechanical extraction process. Flowers or plants were mashed and pressed until the scent had been squeezed out and collected. This was a hard job and not particularly rewarding because it took a long time to collect a significant amount of essential oil using this process. There is another process that was used by the Egyptians known as chemical extraction. This process involved the use of heat and alcohol. Specific scented oil mixtures had their own names, just like modern day perfume. It was very common for a scented oil mixture to be named after the city that it was invented in. For example, there was a popular mixture known as the Mendesian, and it was invented in city of Mendes. As far as scented oil quality went, each bottle of oil had to have extremely long lasting scent. Egypt actually exported a majority of their scented oils to other countries, especially Rome, so it was important that the scents were able to retain their potency over long journeys. Egyptian scented oils actually had a lot in common with today’s perfume. One such similarity was the expectation that two bottles of the same perfume should smell the same. The Metopion was a popular scent that smelled like myrrh, galbanum, and cardamom. An ancient person would expect that every bottle of the Metopion would smell like those three ingredients. They expected the quality to stay at a consistent level. Another similarity with modern day perfume is that the Egyptians stored their oils in beautiful jars or bottles, just like the bottles perfume come in today. Generally, the vessels would be made of glass or stone. In the eyes of the Egyptians, the best kinds of vessels were made of alabaster. They were all decorated and sometimes even bejeweled. The scented oils were kept in cold, dark places for the sake of quality. They could last for many years in such an environment. Scented oils were in fact a luxury for the actual Egyptian people. Everybody used unscented oils all over their bodies on a daily basis, as regularly as kohl. The unscented oils worked double time as moisturizer and protection from the sun. Scented oils, on the other hand, had different purposes. When Egypt began to produce scented oils, they were used only for religious purposes. It did not take long for the scented oils to start gradually becoming something that royalty and rich people used for aesthetic reasons. By the time Egypt reached the Golden Age, the majority of noble and rich people wore scented oils. There was never a time when the luxurious oils became affordable enough for commoners. They were made mostly to sell to rich and noble people and to export to other countries. Scented oils were really used for four different aspects of Egyptian life and death. Those aspects are aesthetics, religion, medicine, death, and the afterlife. Women definitely wore more scented oils for aesthetic reasons than men. The queen sometimes wore her own scent and it was off limits to anyone else, much like her regal nail polish. The king usually wore scented oils as well, as they were considered pleasing to the gods. Naturally, the pharaoh had to please the gods in as many ways as possible. Because beauty was so important in ancient Egyptian culture, it makes sense that cosmetics and pleasant smells were a significant part of the religion. Every day, make up was applied to the statues of the gods and goddesses. The statues were also anointed with scented oils. Incense was burnt at all sorts of social events (parties, banquets…) and it was also burnt for religious ceremonies. Oddly enough, there is no evidence that the pharaoh was anointed with oils during his coronation. Like popular Western religions, frankincense (the scent of the gods) and myrrh were very important religious scents. 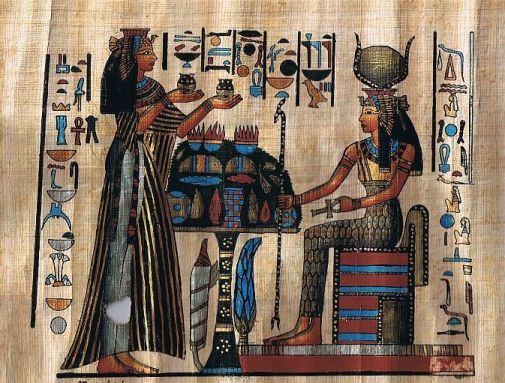 Egyptians also believed that scented oils brought you closer to the gods. Oil makers were very careful to do their jobs right because if they didn’t they would upset the gods. Essential oils were also used for many things in medicine. Egyptians found that specific oils helped with different health problems. For instance, rose oil helped with stress problems, depression and insomnia. Lavender, on the other hand, was more useful on the physical level to heal cuts and skin problems. By mixing specific essential oils together they could create remedies for different problems. Oils were often made into healing salves or lotions as well. Scent was a part of both the physical death and the afterlife. In mummification, the body was anointed with fragrant oils, incense, spices, and resins after it had been washed and cleaned out. Straw was soaked in the same ingredients and stuffed into the body cavity. Myrrh, frankincense, and jasmine were definitely scents used in this process. Enough scented oils were placed in the tomb for the deceased person to use it in the after life. It was believed to help make their journey through the afterlife easier. It was especially important for pharaohs to have plenty of oils in the after life. King Tut’s tomb had lingering scents even after thousands of years. The ancient Egyptians had a relatively healthy relationship with beauty, partly because of their religious belief. They understood that beauty was more than skin deep, but had a natural appreciation for beauty on the surface. Some people these days would call that shallow and claim that such appreciation should be saved only for the personality of a good person. However, it would take a particularly strong people to be able to honestly say that both physical and interior beauty matters in this world and maybe in the next as well. Cavitch, S. M. (1959). In S. M. Cavitch, The Natural Soap Book (pp. 219-222). Pownal VT: Storey Communications Incorporated. Edwards, F. G. (2000). In F. G. Edwards, Wild Hearts to the Healing Herbs (pp. 219-222). New York: Ash Tree Publishing. Hawass, Z. (2000). In Z. Hawass, Silent Images (pp. 117-123). New York : Harry N. Abrams Incorporated. McGilvery, C., & Reed, J. (1995). In C. McGilvery, & J. Reed, The Essential Aromatherapy Book (pp. 8-34). New York: Hermes House Anness Publishing Inc. .
Ragas, M., & Kozlowski, K. (1998). In M. K. Ragas, Read My Lips: A Cultural History of Lipstick (pp. 34-40). San Francisco: Chronicle Books. Sands, E. (2005). In E. Sands, The Egyptology Handbook; A Course In the Wonders of Egypt (pp. 34-35). Candlewick Press.